Seven Days Blogs: Freyne Land: Statehouse Skinheads? So, the ski industry must have loved the thaw, eh? For awhile there, it sure felt like winter, didn't it? The Statehouse gets back into action today. As time passes, styles change. Once upon a time hair was big. 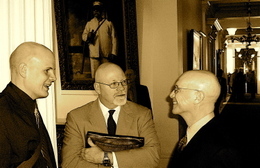 Nowadays, the less hair the better is the style, as demonstrated by this trio of (l. to r.) Todd Bailey, director of the Vermont Alliance of Conservation Voters, Bob Stannard, blues-harp player and lobbyist for the anti-nuke Citizens Action Network, and State Rep. Tony Klein (D-East Montpelier). Anyway, it's "Inside Track" day here at the ranch in Burlap. High temp's supposed to be 35 degrees. High enough for the windshield repair guy to come and replace my cracked windshield. An interstate pebble did the damage. Didn't know previously that there are three layers to a windshield. Just the outer one is cracked. The repair guy couldn't come last Tuesday because it was "too cold." He told me not to worry about the whole window breaking or caving in. I haven't. But the crack has extended itself from a couple inches to about three feet.